Welcome to the wonderful world of the unicorn of the sea! Narwhal stuffed animals come in all sizes and colors and couldn't be more fantastic if they tried. Find your favorite today! Read more. At Stuffed Safari, you can find a realistic stuffed narwhal, a colorful stuffed narwhal, or any other kind of narwhal plush that makes you smile! These unique creatures are full of personality and their plush counterparts are just as amazing. Narwhal stuffed animals get to be bright and colorful to really take the unicorn of the sea thing to new heights. Punching them up a bit compared to the real thing makes them even more magical and fun. Many of these stuffed narwhals take the imagination to its limits with rainbow colors and fluffy plush bodies. Might as well go all out, you know, in case being a whale with a horn wasn't special enough. Real narwhals would be proud to see how good they look in bright colors. If they only knew how much we've spruced up their image! 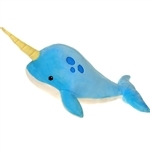 The fact is, narwhals don't shop on the internet so they have never seen our amazing selection of plush narwhals. We are 100 percent sure that they would approve. Take a look at our cute narwhal stuffed animals to see if you agree. We're guessing that if you love narwhals you will love every one of these cuddly stuffed narwhals! Shop.